Mark Knoop is a pianist and conductor living in London, UK. He studied piano with Stephen McIntyre at the Victorian College of the Arts and in Europe with mentors including Herbert Henck, James Avery andPeter Feuchtwanger. He studied conducting in Melbourne with Robert Rosen and is co-artistic director of the Libra Ensemble. Mark has appeared throughout Europe, the United Kingdom and Australia and in New Zealand, South Korea, Mongolia, United States of America, Canada and at festivals including the Transit, Ultima, Huddersfield,Spitalfields, Borealis, Lucerne, Spor, Melbourne, and Adelaide Festivals, and the ISCM World Music Days. He performs with such groups as plus-minus (London/Brussels), Ensemble Exposé (London), ELISION Ensemble (Brisbane), 175 East (Auckland), musikFabrik (Köln), WDR Rundfunkchor Köln, Ensemble Offspring (Sydney) and Ensemble Laboratorium (Europe). Mark has conducted numerous premières including Jason Eckardt’s Tongues, Bryn Harrison’s Rise and Repetitions in Extended Time, Erik Ulman’s Thoughts on the Esterhazy Court Uniform; and the Australian premieres of Elliott Carter’s Clarinet Concerto, Hans Werner Henze’s Kammermusik 1958, John Cage’s Sixteen Dances, and Michael Finnissy’s Various Nations. He also performed the Australian premieres of Finnissy’s mammoth piano cycle The History of Photography in Sound and Richard Barrett’s Tract. Mark has worked with many respected composers including Richard Barrett, Chris Dench, James Dillon, Michael Finnissy, Helmut Lachenmann, Liza Lim, Thomas Meadowcroft, Matthew Shlomowitz, Erik Ulman, David Young, and many others. 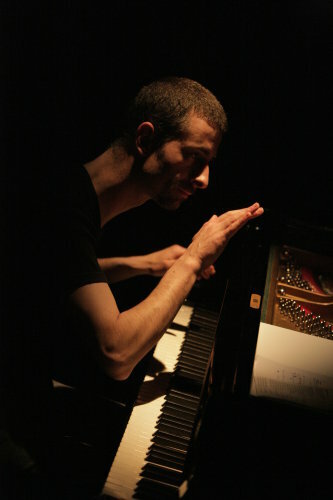 Solo works composed for him include Chris Dench’s into the wormworks and the heart’s algorithms (both members of the Phase Portraits cycle), Benjamin Marks’ La Chute, Chris Newman’s Air Fool Agony Face, and Dominik Karski’s Streams Within for piano and ensemble. His recording of the complete piano music of David Lumsdaine (Tall Poppies) was released to critical acclaim in 2009. Recent projects include recordings of Finnissy’s Piano Concerto No 3 with 175 East, and of works by John Cage for the Wergo label.